Belated but no longer non-existent: pics from my trip to Readercon. At a silly rainforest-simulated cafe in a mall, where a mutant frog sneaks up behind me. Also at the rainforest cafe, Alan Deniro and an angry alligator. Now they're turning up in malls in Massachusetts, I see. Unsuspecting Kristin Livdahl and Matt Cheney before the giant snake coiled about them a moment later. Lauren McLaughlin is not fooled by someone professing they are not mafia. Matt Cheney, apparently frightened by the possibility of being surrounded by mafia members. Rick Bowes and Jeff Ford, telling stories in the bar as usual. 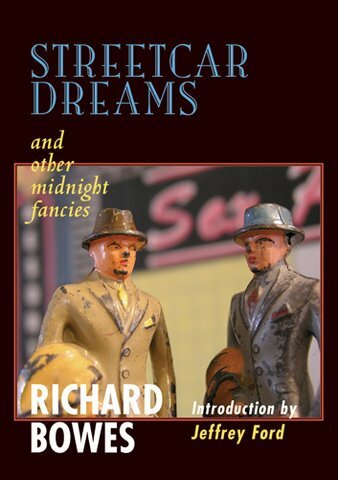 Lots of really great short story collections are being released this year, but one you should take time to get a copy of and read is Streetcar Dreams, by Richard Bowes. This collection has some of the best contemporary fantasy and horror stories I've read in years inside its pages. Rick Bowes writes stories that are at once totally gritty realism and out and out fantastical in nature. It's a harder blend of two different styles of writing to merge than it seems sometimes, but I don't think anyone does it quite so well as Rick does. So check out this collection. It'll be well worth your time and money. ...for running behind on emails, packages, and other things I am behind on this week. I've been searching for an apartment, getting lesson plans ready for a fall syllabus, writing, working out, celebrating best friend's birthday this past Monday, celebrated my own last night, and babysitting niece and nephew here and there as well. I'm going to try and catch up with email this week. Till then, thank you all who wished me happy birthday or sent gifts. I had a great day with friends Regina, Mario, Brooke, Angela and Dan, drinking a variety of martinis at Imbibe, the very cool martini bar in downtown Youngstown with the bestest bartenders Chris and Carolyn, and then playing pool badly and dancing at Utopia afterwards. Too. Much. Fun. Tomorrow I'm seeing Lady in the Water with a friend. I'm hoping that the Washington Post review is the correct one. Again, I'll be in touch as soon as I can! Trying to catch up from my week in New York and at Readercon, which was a wonderful week indeed. While in New York I found a most amazing Japanese izakaya (traditional pub) where I was able to enjoy chu-hai and shochu and sake as well as all my old favorite Japanese foods as well. All of the staff were from various parts of Japan and it was so good to hear the woman who seated people call out to the other servers, "ni nin me sama!" Two honorable guests! And for the cooks and servers to call out thank you in Japanese as we left. For friends in Japan who may not believe a real izakaya can exist outside of Japan, I've taken pictures to prove it! It was the real deal! More pictures to come from Readercon. That's all for today. I have a date with the second and third episode of Tipping the Velvet, which is proving to be as exciting and racy as the novel. I already know what happens but can't wait to see it actually played out. I wish I could write big, thrilling, lesbian historicals like Sarah Waters! Twenty Epics, an anthology of short stories attempting to capture the essence of epic narrative in as few words as possible, has finally been released! I've been waiting for this anthology to be available for a long time. My story, "The Creation of Birds" appears in its pages, which are really beautifully edited by David Moles and Susan Groppi, and graced with the wonderful cover art of Lara Wells. To celebrate the release of the anthology, many of the writers who have stories in it are blogging and journaling about the book, as well as the stories we wrote for it. As for my story, I wrote "The Creation of Birds" around the time I was twenty-five years old. It's part of a triptych of stories inspired by women painters who had been part of the surrealist movement in the early half of the twentieth century. (The second story in the tiptrych will be published in the anthology Salon Fantastique this September). This particular story is inspired by the art of Remedios Varo. Twenty Epics is full of so many different kinds of takes on the epic story that, if you purchase it, it's nearly impossible to be disappointed by the book because of its varied themes and settings and styles. Well worth your while. So by all means, get yourself a copy and enjoy twenty epics told in under ten thousand words each. If you do happen to read it, please leave a review of the book at Amazon and/or David Moles' journal and tell us what you think! First night, the most wonderful Indian food I've had in years. Then Amy Sedaris' new movie "Strangers With Candy". It was either this or Al Gore's documentary "An Inconvenient Truth". I bit my nails, deciding, because I felt I *should* go see the documentary. But I was tired from traveling and decided the Sedaris movie would be better at that moment. Which turned out to be a great choice. That movie is soooo funny. I haven't laughed till my stomach hurt in the movie theater for a while. There is Japanese written in so many places in New York. From restaurants with signs in their windows in Japanese saying they're hiring waiters and waitresses, to buildings where Japanese residents must live because there are reminders in Japanese on the doors for them to lock the place up as they leave. If I lived here, I could still use what I learned in Japan almost every day.